Kaer Morhen stage also included. Geralt of Rivia, the protagonist from CD Projekt RED’s The Witcher series, will be a playable character in the upcoming fighting game Soulcalibur VI from Bandai Namco, the company announced. The training grounds of Kaer Morhen will also be a playable stage. Bandai Namco was the publisher of both The Witcher 2: Assassins of Kings and The Witcher 3: Wild Hunt in European territories. Geralt was trained at the elite School of the Wolf and is considered one of the deadliest monster slayers. He possesses superhuman reflexes and strength, as well as superior sword fighting skills. 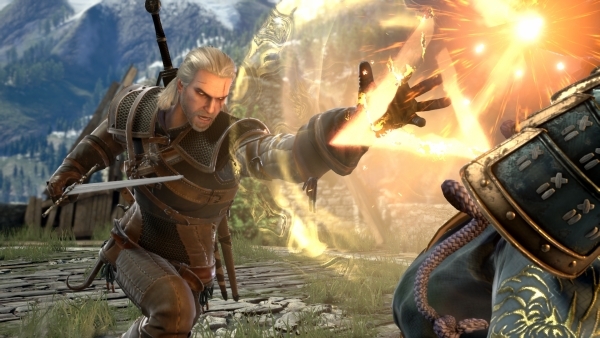 Players who choose to fight as Geralt will utilize the witcher’s signature fighting style — a combination of swordplay, ability-enhancing potions, and combat magic. Doug Cockle — the English voice of Geralt of Rivia — returns in Soulcalibur VI to reprise the role. Gamers will also be able to fight in Kaer Morhen — home keep of the School of the Wolf. Accompanying players in battle will be “Hunt or be Hunted” — an iconic composition from The Witcher 3: Wild Hunt soundtrack. Soulcalibur VI is due out for PlayStation 4, Xbox One, and PC in 2018. Watch the Geralt reveal trailer below. View a set of images at the gallery.